Sometimes when importing a bank file, transactions are imported showing expenses as income, or income as expenses. The great news is, this is easily fixed! 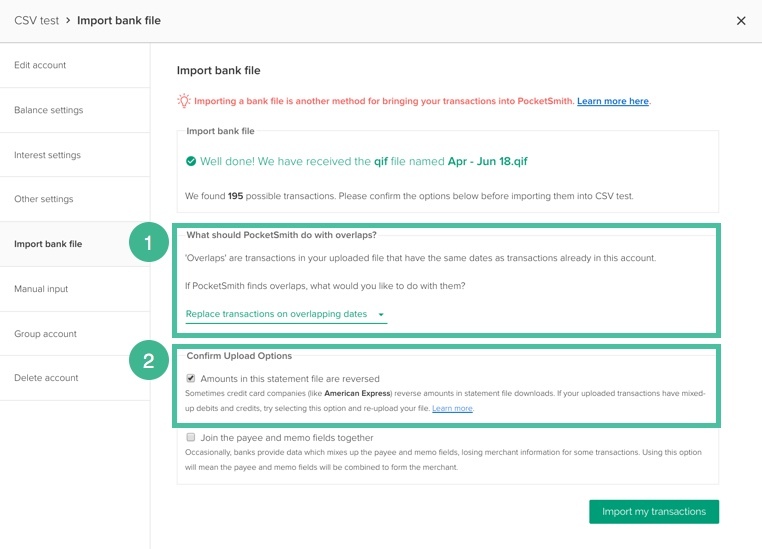 This issue usually only happens for credit card accounts updated by uploading a bank file, and seldom happens with an account connected to a bank feed. For example, some credit card providers may show an amount spent as 23.95 and a credit card repayment as -300.00. This does not match what PocketSmith would expect as the spent amount should be -23.95 and the repayment should be 300.00. If you are experiencing a reversed balance issue instead, where an account that is meant to be negative is displayed with a positive balance, you need to adjust the account balance settings. On the import form, choose Replace transactions on overlapping dates . This ensures all incorrect transactions will be replaced with the new correct ones. Then tick the checkbox option Amounts in this statement file are reversed. This will ensure incorrectly marked debit/credit transactions are fixed. You should only use these options when the amounts of each transaction are incorrectly shown as negative when it is a positive amount, and vice versa and not if the balance is the wrong way round.